Here I am again, surrounded by a mountain of kit, getting ready to fly to Sydney for the North Face 100km in the Blue Mountains this weekend. It’s a 100km with 5500m ascent, the profile is hilly, with the trails becoming more and more technical and spectacular when we head up into the mountains. The course is framed on the West by Sydney and the Blue Mountains, which owe their name to the blue reflection caused by the volatile essences of the eucalyptus forest. The biggest challenges will be the climate and the humidity, but maybe not so much for me! I’m guessing 16-17 hours will do for me, anything under 20 is fine. I don’t really want to be out there that long, but I also don’t want to bust a gut racing this given this is a ‘training’ race. Follow live race updates on the Salomon Running facebook page as well as the Salomon Running Australia facebook page. When I was last in the Blue Mountains, I loved the story of the Three Sisters, one of the main attractions in the Blue Mountains. 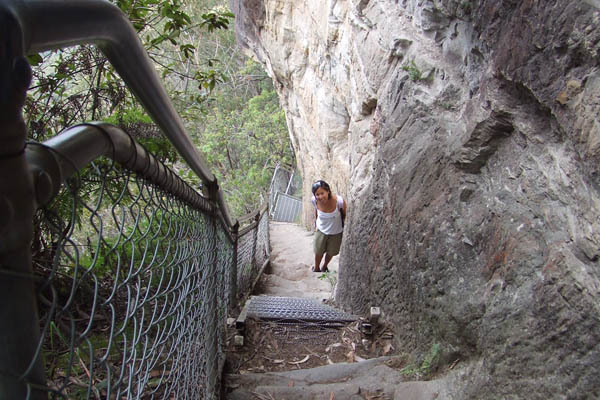 The Aboriginal dream-time legend has it that three sisters, ‘Meehni’, ‘Wimlah’ and Gunnedoo’ lived in the Jamison Valley as members of the Katoomba tribe. These beautiful young ladies had fallen in love with three brothers from the Nepean tribe, yet tribal law forbade them to marry. The brothers were not happy to accept this law and so decided to use force to capture the three sisters causing a major tribal battle. 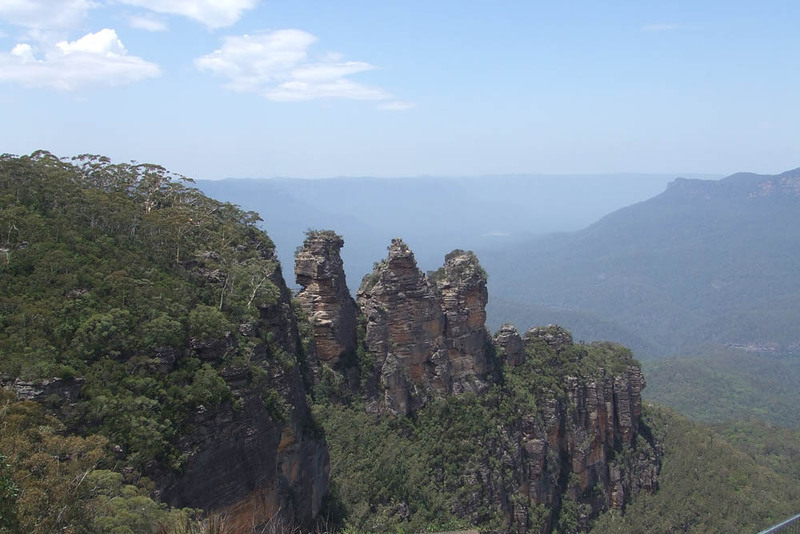 As the lives of the three sisters were seriously in danger, a witchdoctor from the Katoomba tribe took it upon himself to turn the three sisters into stone to protect them from any harm. While he had intended to reverse the spell when the battle was over, the witchdoctor himself was killed. As only he could reverse the spell to return the ladies to their former beauty, the sisters remain in their magnificent rock formation as a reminder of this battle for generations to come. The Three Sisters are 922, 918 & 906 metres tall, respectively. Supermodel worthy! Steep stairs will be the order of the day! I haven’t read the course instructions enough to know if we encounter The Three Sisters enroute yet .. but I know that there will be a lot of climbing on this one! There’s also a star-studded field, with Salomon runners Kilian Jornet and Ryan Sandes at the start line on Saturday, together with defending champion Stu Gibson and last years GNW winners Andres Vize and Beth Cardelli … that’s a lot of dust I’m going to be eating! Looking forward to catching up with friends from the GNW last year, the Aussie ultra-running community are lovely and it’ll be good to see what everyone’s been up to since November. “There will be live results and a blog during the weekend of the The North Face 100. The link will be from The North Face 100 website – www.thenorthface.com.au/100. There is also an iPhone application to allow you to keep track of any runner in the race. Just go to the ‘app store’ on your iphone or itunes on your computer. Search for ‘Sport Splits’ and download the free application. Then open the Sport Splits application and select the top right hand corner ‘+’ button to add an event. Then Choose The North Face 100 from the list of events. You can then search for any bib numbers in the race and view the times of that person through each checkpoint. The data is fed live from the live website so new times should come up within a few minutes of the runner crossing the timing mat at each checkpoint. You can add any bib numbers to your favourite runner list so you can continue to easily check for new data. This will be a nice race…All the best. be careful! i downloaded the app but can only see it tomorrow i guess..